When my son was a toddler he had a VHS tape, the Animal Alphabet. There was an animal assigned to each letter with a corresponding song and cartoon. Ox represented the letter ‘X’ with a song that taught “but X does not start Ox”. They were clearly reaching for some animal, any animal for the letter ‘X’. So 20 something years later, I find myself staring at a blank ox and the song pops into my head. I think about the the letters ‘O’ and ‘X’ and remember letters that I received covered in ‘X’s and ‘O’s. Some scrawled on notebook paper, some thoughtfully written in an elegant hand and some appearing in front of me in digital form. X’s and O’s! Hugs and kisses! I want to cover an ox with hugs and kisses so people will remember those letters that they received and maybe be prompted to send one of their own. 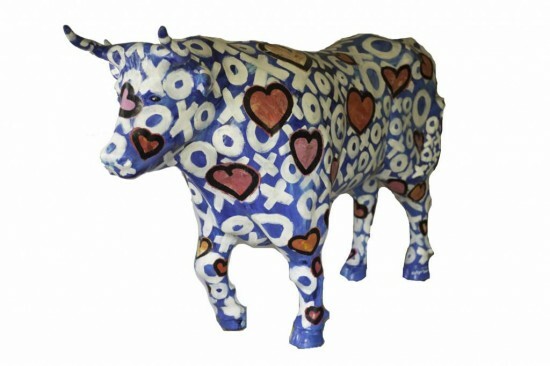 I made my ox blue because if the legend of Paul Bunyan teaches us nothing else, it teaches us that all the best oxen are blue!